Rottweiler is one of the oldest European stock dogs, they have a natural herding instinct, they were originally used by the Roman legions to drive the cattle brought by them to feed their soldiers. When working with cattle the Rottweiler shows a gathering/fetching style and reams directions easily, they also searches out the dominant animal and challenges it, upon proving its control over that animal it settles back and tends to its work. If Rottweilers are trained properly then you really should have no problem with dominance, however in some cases Rottweilers have begun herding cattle without any experience at all. They are extremely intelligent, strong, tough, alert and willing to work. 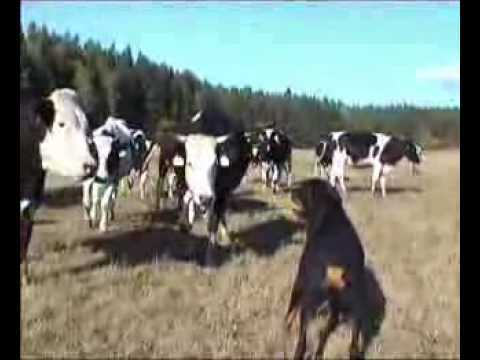 In this video you can see Rottweiler herding cattle test filmed in New Zealand.